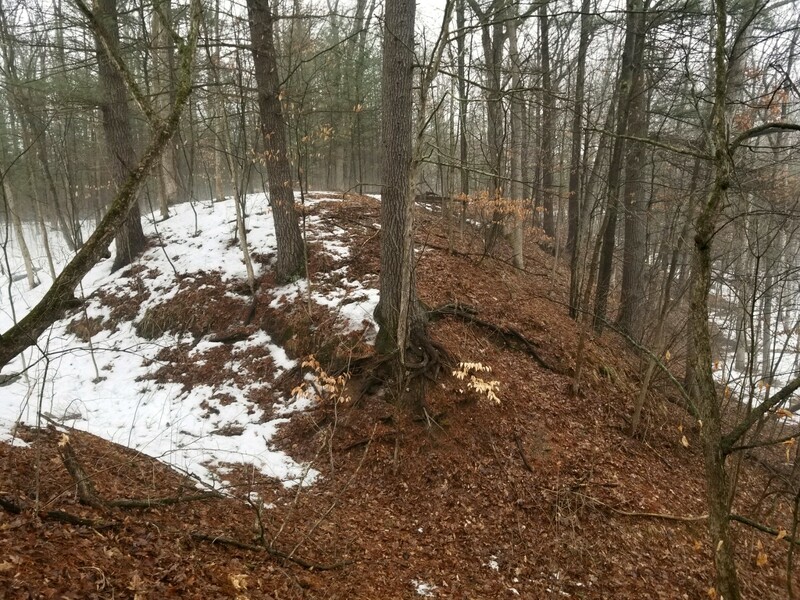 Off-duty Michigan Department of Natural Resources conservation officers helped rescue a 59-year-old man late Tuesday afternoon in a wooded area near Halls Lake, on the west side of Isabella County. The man, from Remus (in Mecosta County), had been reported missing earlier in the day. The man’s girlfriend told 911 dispatchers that her boyfriend had been missing for several hours after their dogs had jumped out of their truck and he followed them into the woods. Unaware of her exact location, the woman was able to describe a green gate to dispatchers. Adding to her distress, the woman was concerned because her boyfriend did not have a phone with him and has had numerous past strokes and a heart condition. Aware of their specialized search and rescue training, Isabella County Central Dispatch contacted Michigan Department of Natural Resources Conservation Officers Mike Haas and Josh Russell. Off-duty, Haas and Russell both were nearby at Haas’s house when they received the call. 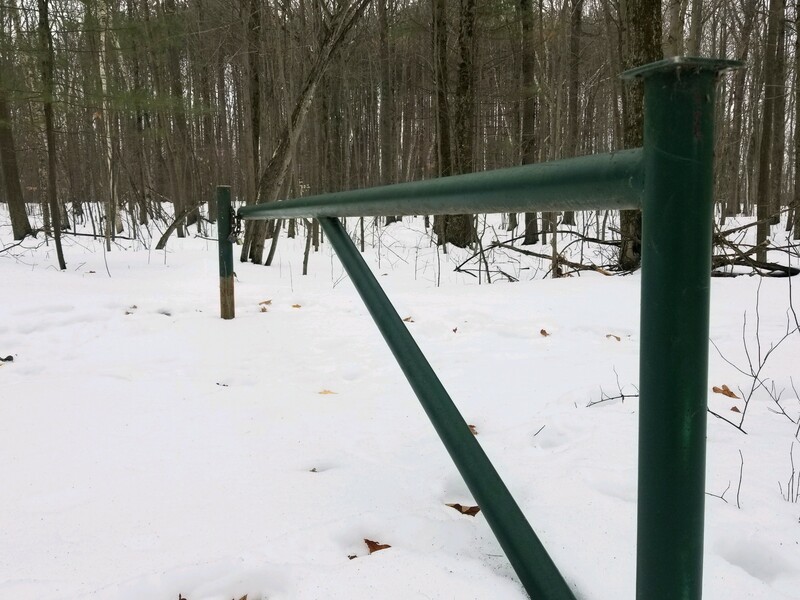 Familiar with the rural area, the COs knew the green gate the woman had described was on natural area land owned by the Chippewa Watershed Conservancy Group. The officers were particularly concerned because of the man’s history of health complications, along with the terrain. Having access to Haas’s search and rescue gear, the two COs drove an unmarked vehicle to the green gate's location. They found the man’s girlfriend near South Old State Road, located southeast of Halls Lake. The COs identified themselves as conservation officers and the woman frantically repeated her concerns – that her boyfriend did not have a phone and had a history of medical conditions. Haas and Russell quickly found the man’s footprints in patches of snow, leading them through hardwood hills and thickets. 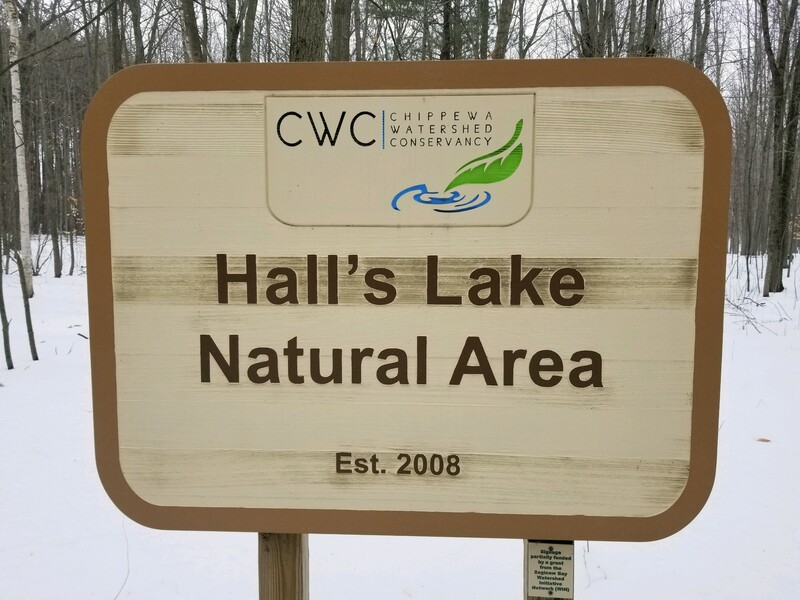 The COs traveled about 2 miles through the woods, maintaining continuous radio communication with Michigan State Police troopers and dispatchers, informing them that their tracking was leading them toward a rural road on the north side of Halls Lake. State Police troopers drove toward that road and found the man wandering west on West Broomfield Road, near Costabella Avenue. The COs arrived at the scene about five minutes after the man had come out of the woods. By the time he was found, the man had been missing for four hours. “We were pleased at the outcome of this search. Communicating with the other agencies, utilizing our search and rescue training and being familiar with the area allowed for a timely conclusion to the search,” Haas said. Medics evaluated the man on-scene. He was cold, but in good condition and did not require further medical treatment. Additionally, the dogs found their way back and are healthy and safe. Michigan conservation officers are fully commissioned state peace officers who provide natural resources protection, ensure recreational safety and protect citizens by providing general law enforcement duties and lifesaving operations in the communities they serve. Learn more at Michigan.gov/ConservationOfficers. Halls_Lake_Gate.jpg: The woman who reported the missing man to 911 dispatchers was not aware of her location, but was able to describe a green gate on the land. 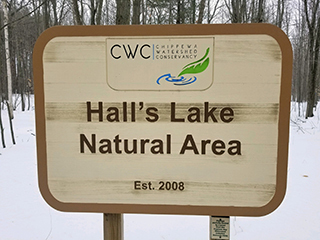 Halls_Lake_sign.jpg: Halls Lake is located on the west side of Isabella County. The land is a natural area owned by the Chippewa Watershed Conservancy Group. Halls_Lake_terrain.jpg: Being familiar with the rural area, Conservation Officers Haas and Russell knew the terrain would be difficult to navigate, with the steep hills and ice-covered beaver ponds.